A holiday loan may be a solution to your debt hangover at the end of the holiday season. The holiday season can be an exciting time, where many of us either stretch our budget to the limit or forget it all together. In 2018, according to the National Retail Federation, Americans spent, on average, $1,007.24 each during the holidays including gifts, decorations, and other trappings of the season. That’s up from about $740 in 2013. Holiday loans don’t have to be used for just traditional gifts. They can be used for holiday trips for the family or trips as gifts. They can be given at the holidays and used at another time of the year. They can be used for student tuition or other types of financial aid. They can be used for wedding gifts. The possibilities are endless. Using a holiday loan instead of other type of financing for the holiday season is getting more common. It might be that this type of financing will make the holiday season less stressful. Otherwise, the first of the year may roll around and we may realize that we’re either deep in debt or we’ve depleted our savings and checking accounts. If you plan ahead and consider a holiday loan, that could help. A holiday loan is a relatively short-term personal loan, in amounts ranging from $500 - $5,000, that is typically made by a commercial bank or credit union. Holiday loans are not payday loans or cash advance loans, both of which have high interest rates. Since a holiday loan is not secured by collateral, a lender has no recourse if you default on the loan. The lender has no property, like an automobile or a house, to take from you. The lender can, however, garnish your wages and send the debt to collections, which makes you subject to a lawsuit. Also, a holiday loan may have a higher interest rate than a loan secured by one of your assets. It typically has a fixed interest rate, which means it doesn’t change during the life of the loan, and is paid off in monthly installments. Why Should You Get a Holiday Loan? Before the holiday season begins, you should do some planning. If you don’t have the extra income in your budget during the months of October, November, and December to use toward gifts, or a special savings account you use only for the holiday season, then you either have to have the money in your savings account or you have to borrow the money from some source. 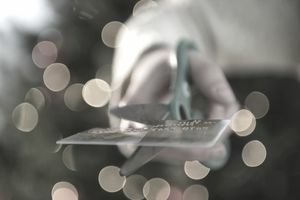 If you don’t want to drain your savings account and you don’t want to put gifts and other holiday-related spending on one or more credit cards, then you should consider a holiday loan. Even though the interest rate on a holiday loan is a little higher than on loans backed by collateral, it is not as high as the annual percentage rate (APR) on credit card charges. What Are the Most Popular Holiday Loan Options? Personal Loan – This is the traditional unsecured loan, with a term from one to five years, and a fixed interest rate. You have to have a good credit score in order to qualify since you are not required to put up collateral. You can go to a commercial bank or a credit union for this type of loan. A credit union is a good choice since they only charge interest on the unpaid balance during repayment. If you have very good to excellent credit or have an account with a credit union, this loan may be for you. Personal Credit Line – A personal credit line is a likely choice for a holiday loan only when your need is great. You are granted a line of credit by a financial institution and you withdraw funds from it as needed. It is unsecured, but it has no ending date. As you repay the principle, you can reuse the funds. These loans are often used for an ongoing project. The interest rate will be a little higher than for a personal loan. You must have an excellent credit score to qualify. Peer-to-Peer Loan (P2P) – Peer-to-peer lending is a relatively new idea in lending that is popular with the holiday loan crowd. Through a loan platform on the web, you borrow from individuals or investors. You make a loan request on the loan platform and it goes out to many possible lenders. You may get back any number of offers. You must be creditworthy. A P2P loan is very much like a personal loan through a bank except you may encounter slightly higher interest rates and you could get a longer term for the loan. You usually pay an origination fee of 1-5% of the principle of your loan. P2P loans can accommodate you if your credit has some blemishes on it. Credit Card Loan – You can always use a credit card for holiday purchases, but the interest rates are higher than the other options. If you pay off the charges at the end of the first month, this is an acceptable option. If you allow yourself to carry the debt, credit card debt can get you into financial trouble quickly. How Should I Get a Holiday Loan? Check your credit score with the credit bureaus to be sure you can qualify. Shop the banks, credit unions, and P2P platforms for the best deals on holiday loans. Keep these factors in mind: Interest rate, fees, APR, and any prepayment penalties. Ask about the term of the loan. How Can Big Online Retailers Change Affinity Online Banking?